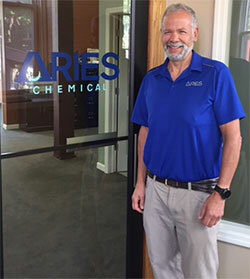 Aries Chemical is pleased to announce that Scott Frasca has joined Aries’ Pulp & Paper Group as a Senior Account Manager. Scott will be responsible for the sales and service of Aries’ pulp & paper customers in the New England area. Scott is a Massachusetts native and currently resides in Maine. A graduate of Marietta College with a B.S. in Biology and Business Management, Scott brings many years of pulp and paper experience to Aries. He has held a variety of sales and marketing positions with Buckman Laboratory and RohmNova/OMNOVA Solutions. Scott is active in both the National, Northeast and Empire State sections of TAPPI/PIMA. His TAPPI/PIMA roles have included positions on the National Leadership Council, Empire State Chairman and Northeast Executive committee. Scott can be reached at either cell: (207) 620-0074 or email sfrasca@arieschem.com.